2019 Oakland Supercross Results: Sometimes after a racer wins their first race, it’s as if a light switch is turned on; all of a sudden, winning is a regular thing. 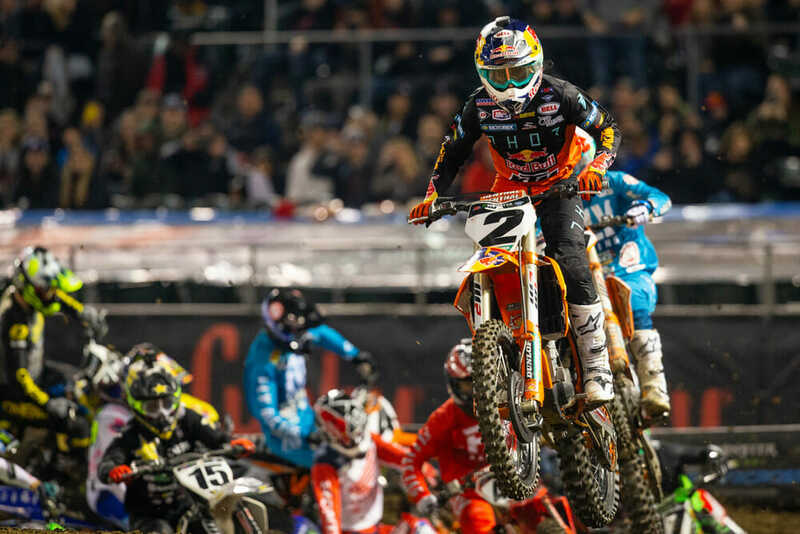 At the Triple Crown event at Anaheim 2 last week, Red Bull KTM’s Cooper Webb won the first of the three main events, then immediately backed it up by winning the second one on his way to winning the overall with a 1-1-3 score. After a performance like that, it’s easy to wonder if it was a fluke, but the good thing about supercross is that we all find out only a week later. It wasn’t a fluke. Webb won again in Oakland. 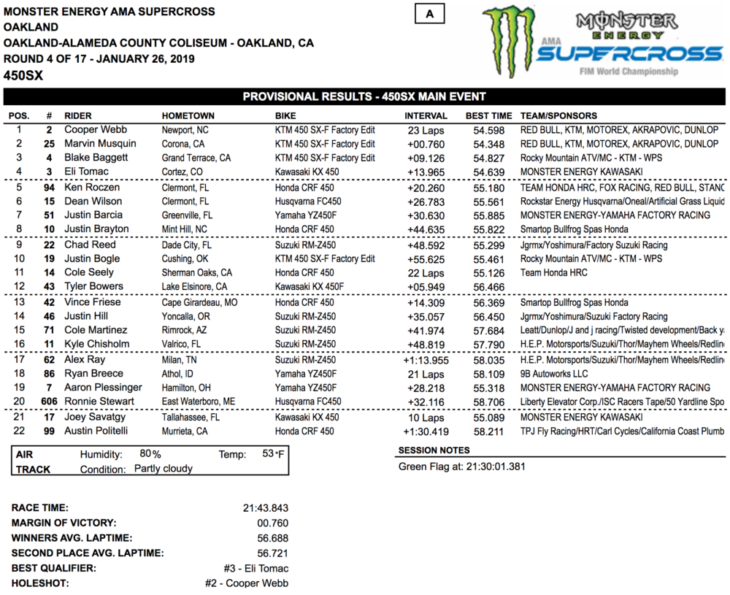 And in the 250cc class, Monster Energy/Pro Circuit Kawasaki’s Adam Cianciarulo became the first repeat winner of 2019 in that series as well. In the 450cc class, Webb had his starts down all night, and he went out and grabbed the holeshot in the main event (just as he did in his heat race earlier), then overcame early pressure from teammate Marvin Musquin before Musquin fell. He had to fend Musquin off a second time on the final lap to take the victory, and he did by just a few bikelengths over his teammate. 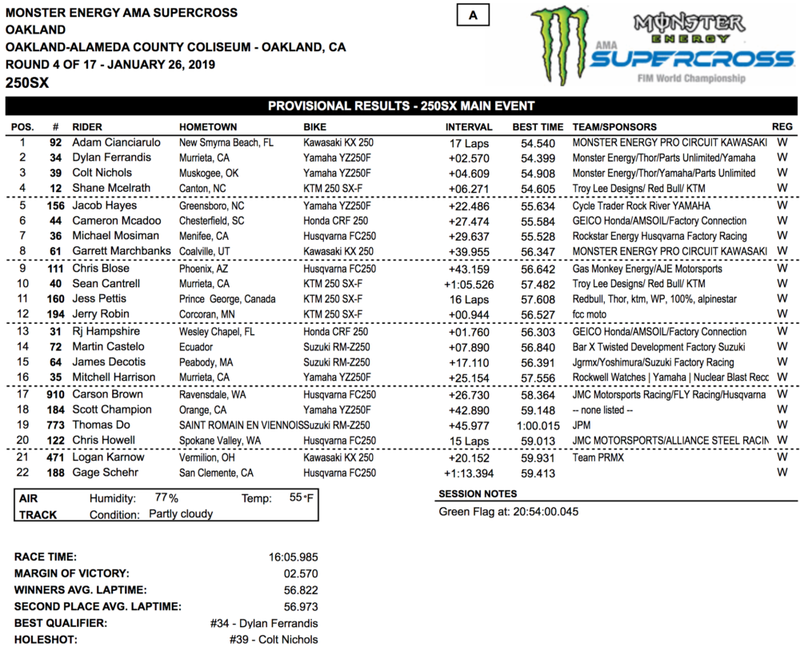 Behind Musquin came Rocky Mountain ATV/MC KTM’s Blake Baggett, making it a KTM 1-2-3 sweep for possibly the first time ever in a 450cc supercross. 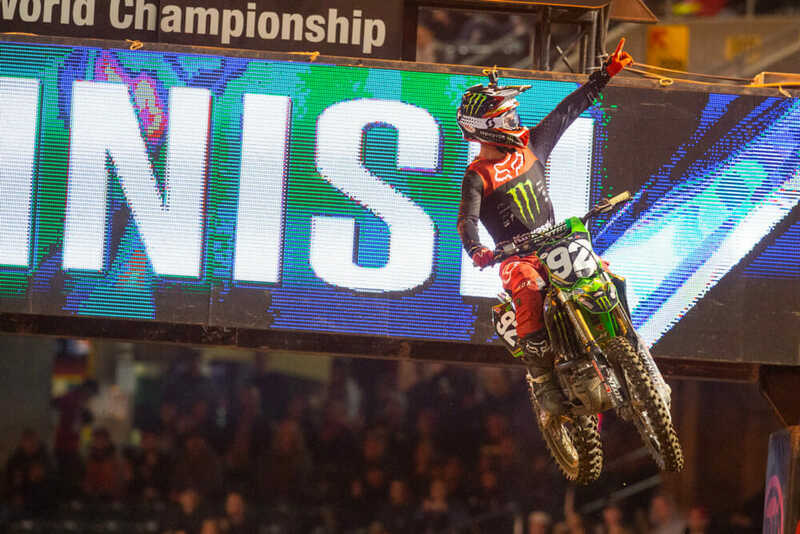 Behind Baggett came Monster Energy Kawasaki’s Eli Tomac and Honda’s points leader Ken Roczen. By virtue of his fifth-place finish, and Webb’s win, Webb is now the points leader in the 450cc class by two points over Roczen, with Tomac and Musquin each a single point farther behind in third and fourth in points. 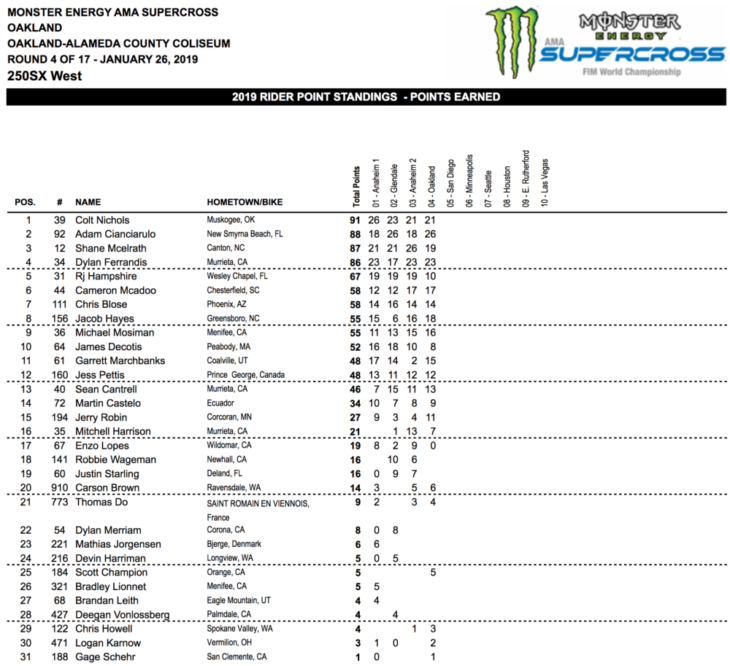 In the 250cc class, Adam Cianciarulo also managed to lead every lap of the main event while the field duked it out behind him. Early in the main, Cianciarulo had to fend off Monster Energy/Yamalube/Star Racing Yamaha’s points leader Colt Nichols, then late in the main he had to keep Nichols’ teammate Dylan Ferrandis at bay. But he managed to do it and took home his second win of the season so far. 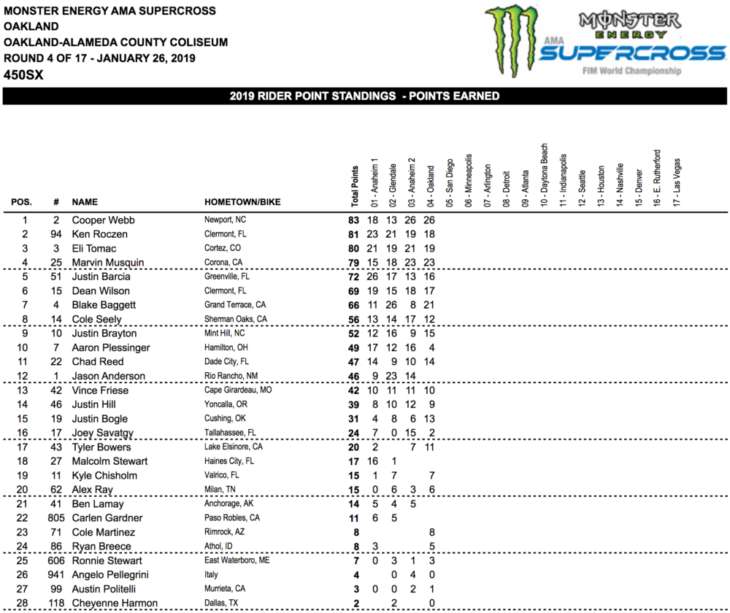 Ferrandis hung on for second for the third time in the first four rounds while Nichols hung on for third, which was enough to hold on to the points lead by three points over Cianciarulo. Last week’s winner, TLD/Red Bull KTM’s Shane McElrath, ended up fourth on the night in front of reigning Arenacross champ Jacob Hayes. McElrath is currently third in points, one point behind Cianciarulo and one point in front of Ferrandis. The series heads to San Diego, California’s Petco Park for round five this coming Saturday night.